RAZVAN COJANU HAS issued a chilling warning to Daniel Dubois ahead of their heavyweight encounter at the Royal Albert Hall on March 8, predicting the fight is not going to end well for the young Londoner. 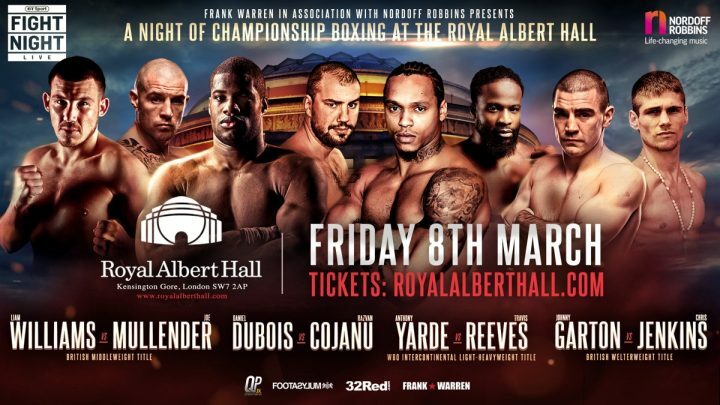 Dubois enters into his tenth professional fight at the stunning South Kensington venue, which will stage boxing for only the second time in the last 20 years when the 21-year-old, along with Anthony Yarde, headline a card that also features two British title battles. In his nine fights to date, Dubois has already collected three championship belts – the WBC world youth, Southern Area and English titles – and, against Cojanu, he will bid to add the WBO Global title to his fledgling CV. He will be up against his toughest test yet when he takes on the California-based Romanian, who challenged for the WBO world title against Joseph Parker in 2017 and extended the New Zealander the full 12 rounds. The 31-year-old subsequently lost to Luis Ortiz before accepting the challenge of another top young heavy, Nathan Gorman, in Manchester last December. Cojanu was originally scheduled to fight Dubois, but the Peacock Gym protégé was laid low by a seasonal virus. Gorman prevailed on points at the Manchester Arena and successfully defended his WBC International Silver title, but was never able to establish an effective rhythm against the awkward and ungainly Cojanu. Dubois himself has previously stated that he will be seeking to make a statement with a stoppage victory, but Cojanu insists the power possessed by the young knockout artist holds no fears for him. On the contrary, the 16-5 man with nine KOs claims it is Dubois who should be fearful of hitting the canvas. Cojanu added that Dubois’ youth will count against him and that experience will be a telling factor on the night.